At the end of last year archaeologists in Scotland celebrated the rare discovery of a complete stone circle. Now, however, a farmer has come forward declaring that he built it himself in the 1990s. 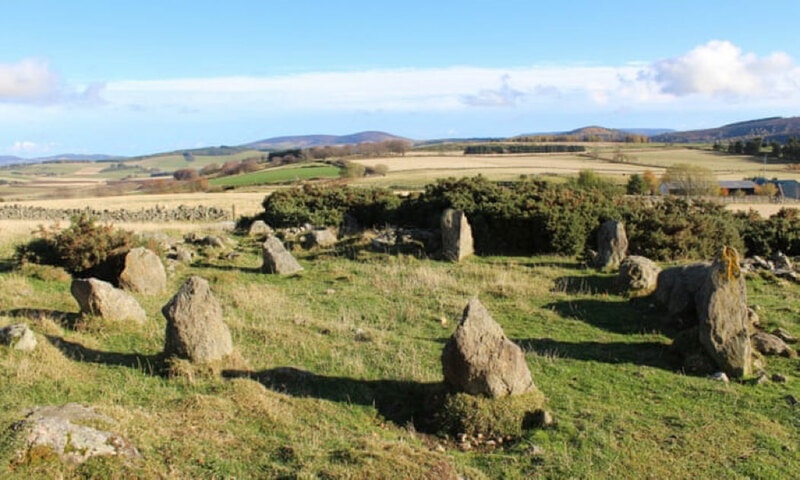 Last year the current owner of the Aberdeenshire farm in Leochel-Cushnie alerted the Aberdeenshire Council about the presence of what appeared to be an ancient stone circle, and it was treated as a significant archaeological discovery by Historic Environment Scotland. A Press and Journal article on 17th December said that, “Neil Ackerman, a historic environment record assistant at Aberdeenshire Council, visited the site along with Adam Welfare, Alison McCaig and Katrina Gilmour from Historic Environment Scotland.” An excited Mr Ackerman told reporters that, “This amazing new site” added to archaeologists knowledge of these unique monuments and of the prehistoric archaeology of the region in general. And while Mr Ackerman could be accused of not having done sufficient research before making such a claim, he was somewhat misled. A Live Science article in December quoting Ackerman said, “One member of a local farming family, now in her 80s, remembered seeing the stone circle at some time in the 1930s.” With no reason to dispute the old lady’s claim he believed in the authenticity of the stone circle and it was heralded as one of the rarest archaeological finds in the UK last year. Responding to this devastating information Neil Ackerman told reporters at The Guardian that it was “disappointing” but he still hopes that the site would still be “used and enjoyed”. The circle adheres closely to the actual methodology applied by the 3500-4500 year old stone circle builders of the north east coast of Scotland and added to its exotic location it’s a fascinating tourist feature, despite its age. The fake monument is a scaled down version of another Aberdeenshire circle called East Aquhorthies Stone Circle. Both are known as ‘ recumbent stone circles ’ - a monument type only found in north-east Scotland and both stone arrangements feature a stone set on its side and flanked by two upright stones. It is believed the moon was observed in this stone portal enabling early farmers to determine when best to plant seeds and harvest crops. A research paper titled The Cardiff Giant, by Ruth A. Gallaher, published on the University of Iowa’s Research Repository discusses a blatant archaeological hoax which occurred in 1869. William Newall, and his cousin, George Hullon were digging on their New York farmland and unearthed an 11-foot-tall stone man that appeared to be in agony. While Native Americans weren't known for carving statues of giant people, not a single archaeologist questioned the authenticity of the discovery and the discoverers proceeded to sell a lot of tickets to the public to come and see the obscurity. The Cardiff Giant was a money making ploy aimed at the wallets of the God fearing people of America. On the contrary, the farmer who came forward in Scotland owning up to having built the stone circle had an important moral choice to make last December after he read of the stone circle’s discovery; he could have said nothing and his creation would have been cemented in the prehistory of Scotland.